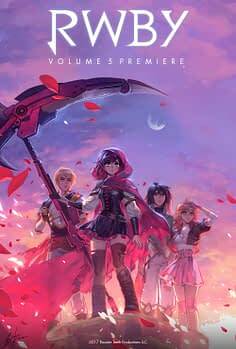 Fathom Events is bringing the premiere of the next season of Rooster Teeth’s hugely popular anime series RWBY to the movie theatres across the US on Thursday October 12th at 7.30pm. A week after their panel at New York Comic Con, “Volume 5, Chapter 1” will be playing at nearly 500 cinemas across the US with select episodes of Volume 4 and a special featurette with cast and crew interviews and other exclusive footage, ahead of the series’ premiere on the internet. RWBY is a future-fantasy series about hunters and huntresses who serve as protectors of a world plagued by monsters. The heroines are a quartet of teenage huntresses-in-training who find themselves thrown into the thick of the battles overseen by a conspiracy that’s out to destroy the world. The show manages to be its own thing without slavishly mimicking the tropes and sexist traits of a lot of anime from Japan. RWBY is arguably the most popular US-created anime series right now. If you go to enough cons, you’ll find legions of RWBY cosplayers and panels with Rooster Teeth are usually filled to capacity with eager fans hungry to find out what’s next for the series as the story gets darker and more epic. 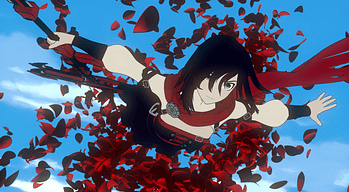 Creator Monty Oum, who passed away prematurely, was responsible for many of the most creative and inventive action sequences on the show, though it continues to thrive in the hands of Miles Luna and Kerry Shawcross. The series has spun off into a video game RWBY: Grimm Eclipse and a spoof comedy CGI animated series on YouTube called RWBY Chibi. The original series is currently enjoying a run on Japanese television with Volumes 1 to 3 re-edied into half-hour episodes and dubbed in Japanese, and a recent manga series written and drawn by Japanese creators.